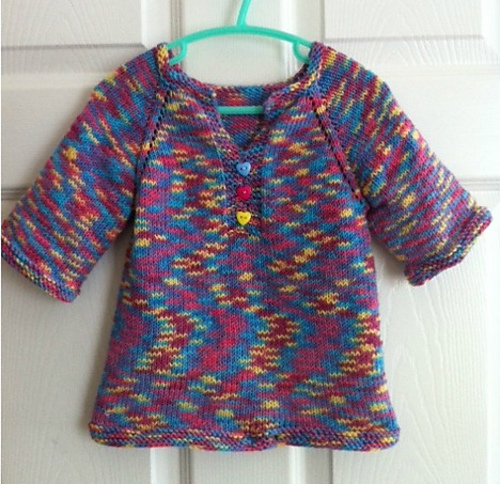 In July 2011, only a few months after I started knitting, I improvised a tunic for my then-toddler. Here's the FO picture I posted, which frankly, has always made me feel nauseous. It still makes my eyes hurt, but after finding it in a bag of old clothes, she thinks it's wonderful and is wearing it again. She is only five but tall for her age and wears age 6-7 in shop-bought clothes - so it's not a tunic anymore - it's a t-shirt. If I'd known it would last so long I would have used a different yarn! My reason for not knitting many children's clothes is that they grow too quickly for it to be worth the time and effort, but I'm thinking of making a bigger one of these.... in a nicer colour, of course. Do you have any garments that were made a long time ago and keep turning up? Or something you really didn't like but it loved by someone else? I agree about children growing so quickly. 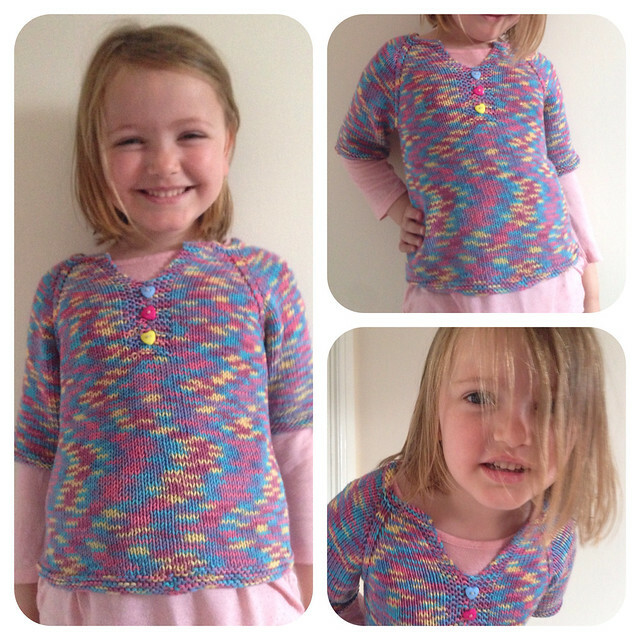 I knitted a lovely jumper for my daughter before she was born. She literally wore it only once before she grew out of it. I wish I had knitted her a blanket. She kept a favourite blanket until she was 7 and then she gave it to her new kitten as a welcome present. My sister knitted a hat for my daughter who wore it for a couple of years. It was probably the best thing that was knitted for her. She is a cute little miss. I like that funny, stank face one.